We’d love your help. 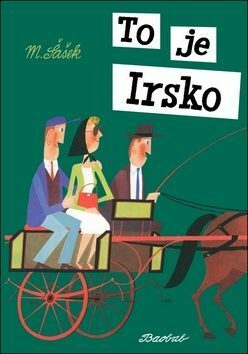 Let us know what’s wrong with this preview of To je Irsko by Miroslav Sasek. To ask other readers questions about To je Irsko, please sign up. 4.5 STARS. This is the first of Sasek's books I've read, though I've known about them ever since seeing them tantalizingly displayed (full price, alas!) at a bookstore in Ashland, OR last summer. I'm certainly going to read more!!! This is like a mini-travel guide or illustrated snapshots of Ireland in condensed form--nods to people and places, country and city, restaurants and relics. I love that it feels at once wonderfully, warmly nostalgic and yet still inspires contemporary dreams of the cou 4.5 STARS. This is the first of Sasek's books I've read, though I've known about them ever since seeing them tantalizingly displayed (full price, alas!) at a bookstore in Ashland, OR last summer. I'm certainly going to read more!!! Na této knize není (pro mě) ani tak důležitý text, jako jsou ilustrace. Až na pár z nich jsem si vždy řekl: ale vždyť to znám, já tam byl. A já tam chci zase! The hell with the risk of coming across as an overrater. I'm dealing out another 5 stars. If only to keep the average rating of this book at the maximum. I'm not going to be the one to bring this average down. 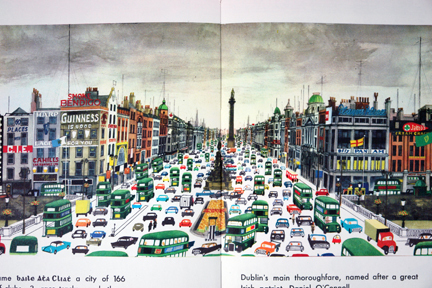 Highlights of this volume of Sasek's series of picture book guides to interesting places include the two page spread of Pontoon, the idyllic pictures of 'subtropical' Glengarriff, and the view of O'Connoll Street (twelve lanes full of cars). But my favourite is the two-page spread of an Ir The hell with the risk of coming across as an overrater. I'm dealing out another 5 stars. If only to keep the average rating of this book at the maximum. I'm not going to be the one to bring this average down. Highlights of this volume of Sasek's series of picture book guides to interesting places include the two page spread of Pontoon, the idyllic pictures of 'subtropical' Glengarriff, and the view of O'Connoll Street (twelve lanes full of cars). But my favourite is the two-page spread of an Irish landscape at the beginning: green hills, low walls, scattered rocks, gray mountains in the back, gray sky above, a few cottages and two sheep. No people. After a short introduction Sasek shows and tells that Ireland "really is green--... every imaginable green-- " Then you turn the page, get the majestic spread, and the minimal caption, finishing the sentence: "green and silent." This is the stuff that 5 star books ar e made of. I noticed a slight change in Sasek's style with respect to the earlier books I've read. Those were from the fifties, this one's from 1964. The style seems looser, more impressionist than cubist. In one instance, the ruins of Dunluce Castle, perhaps a bit too impressionistic. I also see some added texture. I'm glad that a new reprint volume is on the way (This is Greece, IIRC). AFAIK, Universe published these books at the rate of two a year, at the same time. Now they appear to have stepped up to three a year, but spread over the whole year. I can't wait to finally have the whole (18-volume?) series. And I'd like to go to Blarney Castle in county Cork tomorrow, to kiss Blarney Stone "and get invincibly eloquent." I have to talk about innovation in high renaissance art next Friday, so I need all the eloquence I can get. Perhaps I should do it the Sasek way: "Leonardo's work really is innovative-- ...every imaginable shade of..." etc. When I first picked up this book in the book store, I was confused, and thought it was a brand new book and almost didn't buy it. But then I looked to see when it was first published. It was actually written and illustrated in the 1960's, and a friend and admirer of the author reprinted it. The book is dated, but that's what makes it so wonderful. It is utterly charming. Can't wait to get other books he wrote for my children's book collection. This book is great, and I'd love to read the others like it. It gives just enough detail for learning a lot without getting bored. 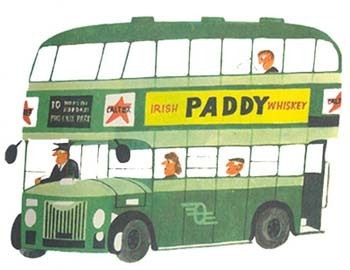 Charming old fashioned illustrations that never lose their appeal. A bit dated but still highly readable. Not for little listeners. A bit dry and no help with pronunciation. This is San Francisco was a more interesting read, or maybe easier, especially for young children. Makes me want to visit Ireland again. Lots of facts about Ireland. We really enjoyed this book. Showed us lots of places and people and got us excited for where our trip will begin. Gorgeous illustrations but not the most interesting text for little listeners. Definitely K and older. There's some marvelously hip artwork in this brief history and tour of some of the Emerald Isle's most famous landmarks. Originally published in 1964, I'm not sure how much of the information remains relevant . 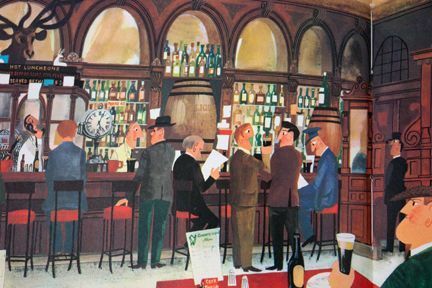 . .
Did you know that in Dublin during the early sixties, there were 166 churches and 700 pubs? I found this on my local library's shelf, but I've got to get my own copy . . . and the rest of Sasek's travel series! This series is pretty cool, but they can be sort of boring to read front-to-back as they are rather long and there's not much fun text. The illustrations are very lovely though, and I like the general overview it gives. I love the greenness of this one in particular; Ireland! I read this to my first through fourth graders and they all loved it!